Baalbek / Giant Pillars -  An epic journey of new discovery so fantastic that our natural instinct would be to block it out. 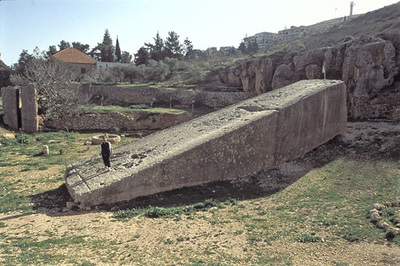 The temple at Ba'albek is famous for its extraordinarily large foundation stones (The largest in the world). 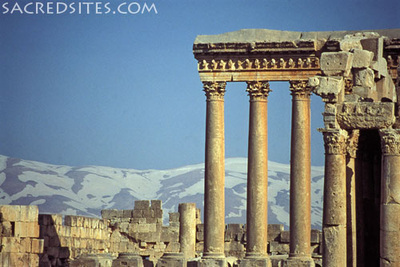 Baalbek located in what is now modern day Lebanon, north of Beirut, in the Beqaa Valley. Inhabited as early as 9000 BCE. Ba'albek shares a geometric relationship with Giza, Egypt. ​As well as signifying the knowledge of a globe, (divided by 360°), this very specific separation of both longitudes and latitudes between the two sites has a secondary significance in that the angle created is (also almost exactly) 51° 51', which is the same angle as that of the exterior faces of the great pyramid at Giza, a site invested with numerous geometric and astronomical proportions. The temple at Ba'albek is famous for its extraordinarily large foundation stones (The largest in the world). These stones also qualify as the largest cut-stones in the history of mankind. Dimensions - There are several varying sources regarding the dimensions of this stone. As such, they have all been compiled in the following chart. 20.9m x 4.8m x 3m = 300 m³. Estimated weight - 1,500 (1) - 2,000 Tons (Fix). The same is true of the three foundation blocks 'The trilithon', in the nearby Baalbek temple, which have the following dimensions: The largest is 65 feet in length, the second 64 ft 10 inches; and the third 63ft 2 inches. They are all 14 ft and 6 inches in height, and 12 feet in thickness. Each block is therefore 350 cubic yards and they are estimated to weigh 750 - 1,000 tons each (1). How was the stone moved - The ancient manipulation of such large stones is still a largely debated phenomena. Common to other similar ancient construction feats, there are no records to testify the means or date of this extraordinary achievement. ​However, the similarity to other extremely early middle-eastern masonry achievements, such as those seen at Ghiza or Abydoss, in Egypt and the foundations of the 'Temple of the mount' in Jerusalem, have not gone un-noticed. 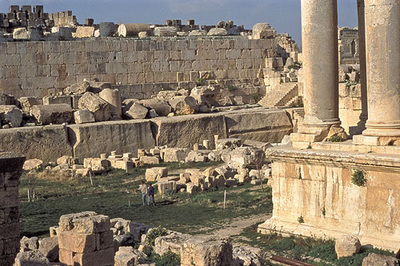 Likewise, there appears to be a connection in the type of stone used, which was invariably quartzite (Red granite in the case of Baalbek). In the past such achievements were accredited to 'The hand of God', 'Giants' and more recently 'Alien life'. However, we must be careful not to lose ourselves in disbelief. ​There is no doubt that these stones were moved, and as with most such unexplainable events, there is likely to be a rational answer if we look for it. For example, the Colossi of Memnon, in Egypt are both estimated to weigh 1000 tons each, and their movement is clearly depicted in hieroglyphs. Why was the stone moved - Just as important as understanding how they were moved, is the question of whysuch immense stones were moved. (Any increase in advantage gained by using large stones is balanced against the increased difficulties of moving them). In Egypt, for example, we can see numerous 85-ton stones that were moved over 500 km to their resting places in and around the great pyramid. 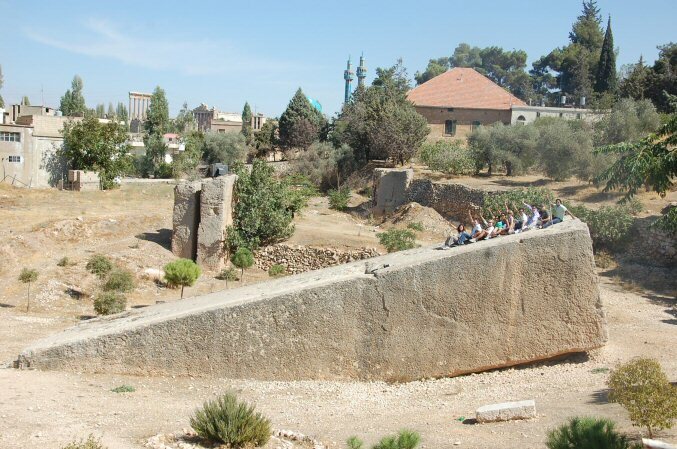 The foundation stones for the Ba'albek temple were moved uphill to their resting place. 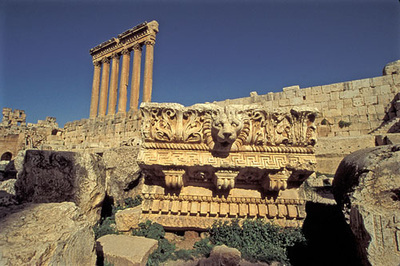 The town of Baalbek is located in Lebanon’s Bekaa Valley, approximately 85km northeast of Beirut and 75km north of Damascus (Syria). 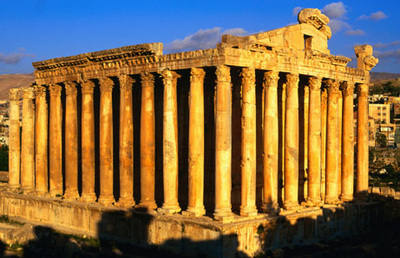 Nowadays the town is famous for its exquisitely detailed Roman ruins which attract thousands of tourists to the country each year and also plays host to the annual Baalbek festival. 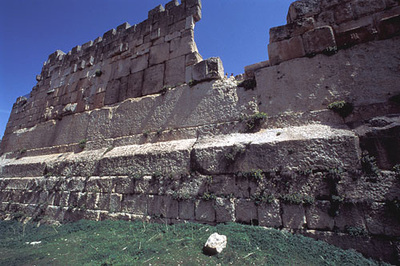 Baalbek originally Phoenician, with settlement dating back as far as the 3rd millennium BC. In the 1st millennium BC the site was chosen as the site for a temple dedicated to the God Baal, from which the city takes its name. In the year 334 BC Alexander the Great conquered the Near East and the city was renamed Heliopolis, a name which was retained by subsequent Roman conquerors – Helios, Greek for sun and Polis, Greek for City – ‘City of the Sun’. In the year 64 BC Pompey the Great travelled through Baalbek and made the city part of the Roman Empire – this act was one which saw the city prosper enourmously. Just 17 years later in 47 BC Julius Caesar founded a Roman Colony in Heliopolis and building works soon began. Just a few years later Heliopolis became known as the foremost city in Roman Syria. Construction of the temples was a huge undertaking which took many years. The Great Temple of Jupiter is said to have taken 120 years to complete, however under later rulers such as Antonius Pius and Caracalla a series of enlargements and elaborate extensions were added. An estimated 100,000 slaves worked on these construction works throughout of the centuries. By the time that Constantine the Great came to power in the year 324, Christianity had reached Rome and Pagan worship was suppressed; as a result, construction at Baalbek was suspended. Later in 361, Julian the Apostate became emperor and reverted back to Paganism and attempted to reinstate this throughout the Roman Empire. This act saw mass martyrdom throughout the Christian community and when the Christian Emperor Theodosius took power in 379, Christianity was once again reinstated in Baalbek. When Muslim Arabs invaded Roman Syria they converted the temples of Heliopolis into a Citadel and restored the city’s original name – Baalbek. In the following centuries the city was invaded by many empires. In addition to the devastation caused by humans, a chain of earthquakes in 1158, 1203, 1664 and 1759 caused the fall of many buildings including 3 of the massive pillars from the Temple of Jupiter. Whilst under Ottoman rule, Baalbek was virtually forgotten and few people visited this once magnificent city. In 1751 two British Architects – James Dawkins and Robert Wood rediscovered this ancient site; however it wasn’t until 1898 when Kaiser Wilhelm II was on a tour of the Middle East that serious study of the site began. ​The Kaiser immediately contacted the Sultan of Turkey to request permission to excavate the site fully. The following seven years saw Baalbek begin to return to its former glory with continual excavations and documentation taking place and a steady stream of tourists coming to view this ancient city.